Become an instant celebrity or paparazzo! This sleek pocketable design is built for easy video—there is no lens cap, no dials to turn, or settings to set. 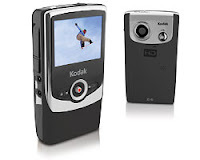 Just turn it on and hit record to capture the action, adventure, and all the juicy details in stunning HD! Make your cinematic debut on any HDTV. Or just pop the USB in the nearest PC and you’re ready to share the fun on YouTube™. Edit, add music, and personalize your flick and easily share with your adoring fans. There’s no such thing as “you should’ve been there” with the Zi6. The AV310 Widescreen is a lightweight (4 oz) wearable display that transforms your small video screen into a large 16:9 widescreen home theater with a virtual 52-inch display as seen from nine feet. Worn like regular glasses, the AV310 Widescreen is compatible with all audio/video devices with composite video-out and includes independent focus adjustments for each eye and removable high-quality stereo earphones. A single removable AA battery affords up to 11 hours of viewing enjoyment. 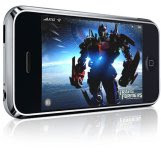 Enjoy video games on your private widescreen display or watch 2D or 3D movies anytime, anywhere in 4:3 or 16:9 format. Never before have wearable displays come this close to the real widescreen movie experience. 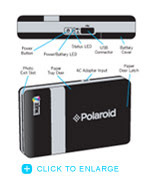 The Polaroid PoGo™ Digital Instant Mobile Photo Printer is the easiest way to print photos from a camera phone. Wirelessly transfer images from a Bluetooth-enabled camera phone to the Mobile Printer and print instantly. Using the built-in OBEX (object exchange profile) Bluetooth in the phone and the printer, connecting and printing becomes instant. This iPod speaker dock offers a rich sound, not to mention several useful features, including am alarm clock (with motion-controlled snooze) and FM radio. * Premium acoustics: Experience high-quality, room-filling sound with 1.9 cm (¾-inch) high-definition, soft-dome tweeters and 7.6 cm (3-inch) high-power, long-throw woofers. * StereoXL™ technology: Widens the sound stage beyond the physical boundaries of the speakers, creating an immersive audio experience. * Adjustable soundfield: Lets you tweak the bass and treble to fit your personal listening preferences. This easy-to-hide, cell-phone-size device can help you locate a lost or stolen personal item, such as a bicycle or car, via GPS. Its motion-sensing technology alerts you via email or SMS instantly when your stuff is on the move. Or use it to help friends and family keep tabs on you if, say you're going hiking in a remote area. Dr. Dre's beats are some of the most potent in hip-hop. Now his Beats by Dr. Dre headphones will let fans hear what he hears. Frustrated by listening to MP3s through mediocre ear buds, Dre spent two years working with Interscope Geffen A&M chairman Jimmy Iovine and audio accessory maker Monster Cable to develop sets that replicate what he hears in the studio. "If people think they like their music on those little ear buds or computer speakers, they'll experience it on a whole different plane," Iovine says. The headphones offer detailed highs and deep bass while shutting out ambient noise. 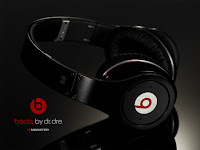 They go on sale Friday at Apple, Best Buy and beatsbydre.com. "They definitely get across what my music should sound like," Dre says. Introducing the ultimate Flexible Lifestyle Displays from Westinghouse Digital. Bring big beautiful HDTV to any room in the house with this stylish 16” LCD HDTV. The new Westinghouse PT-16H610S is a versatile TV packed with unique and innovative features: convenient touch keypad on the base, dual hinge design- great for the kitchen-easily adjust the display forward and back and adjust the height, mount on the wall or under a cabinet -removable bezel and picture orientation features allow you to display the unit when mounted upside down. Packed in this exciting unit is a true HDTV display with an ATSC/NTSC/ClearQAM tuner and 1080p HDMI™ for HD players and composite inputs for gaming. Actually this tool has been written to remove corrupted entries from Windows XP's autoplay. The background is that after an uninstallation of several applications like media players, some invalid entries still may remain in Windows XP's autoplay sections. These are visible every time a CD or DVD is put into the drive and the autoplay selection dialog appears. Now with Autoplay Repair it is possible to remove these invalid entries and even create new or modify existing so called autoplay handlers quickly and easily. But this tool can also be used to remove unwanted entries or just to tidy up Windows XP's autoplay sections for a better overview. In addition to that Autoplay Repair has some other necessary features to offer. In the last iPhone SDK package for application development detected not documented class MPTV OutWindow, which allows video and TV applications on the screen through a dock connector. But for now, there are a number of restrictions that limit efficiency of these options, except to conveniently watch movies in the piece. First, with a view to transferring TV lost control iPhone screen sensitive to touch and as the only option to navigate such applications remain sensor for movements. As another restriction is the fact that applications, if they want to be properly displayed on a TV screen, must be in landscape format. Was allegedly supported and automatically pausing the video playback when receiving a call, but for more details about this option should wait for official information. According to writing on DigiTimesovim pages, Toshiba expects to be bad business manufacturer of flash memory Nando very soon could change for the better. According to the estimates of analysts of the company, use of these memories in the SSD's could become a mass in the next two years. This positive forecast is very important for the entire industry flash memory, particularly Toshiba strategic partner, the company Phison Electronics, which manufactures controllers for these memory, as well as producers of the modules, the company A-Data, Kingston, PQI and Transcend. According to estimates Toshiba, delivered SSD's will in the next year between April and September up to 100,000 pieces per month, to up to the beginning of 2010. amounted to 600,000 pieces per month. ThinkPad X200s and X200t the smallest members of the Lenovo mobile X family, according to many, and currently most impressive ultra notebooks that money can buy. As is most certainly aware, the letter "t" at X200t model designation for the Tablet. In the past few months on these pages, we are engaged in ambitious tablets of various manufacturers, but none of them, say it now, absolutely, nor by what is not equal Lenovo 12.1-inch dot. Construction, the device is identical ThinkPad X300 eulogistic and as such a fantastically strong and robust, while at the same time very slow - less than 1.5 kilograms will not be excessive burden, even for gentle hands. Non-metallic fibers in the framework of the screen at the same time improve the reception of wireless signal - producer of such a solution called UltraConnect. Great screen size of 12.1-inch and native resolution of 1.280x800 points can rotate in both directions, so that when translating device from the classical translators in the tablet does not need to think about the manner in which this operation is performed. 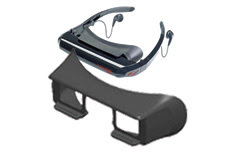 Above the screen is located mechanism floating buckle that allows you to the screen freezes for the body of the device, regardless of which side is facing. 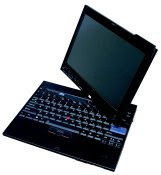 In other words, when the X200t used as a tablet, by simply pressing the screen above buckle becomes firmly fixed to the body - competing tablet regularly are on target for criticism usually does not offer this functionality rudimentary. On one of the edges of the screen (the lower edge when X200t used as a classic notebook) there is a button to activate the computer (as well as a small switch that locked the same, which avoids the possibility of accidental pressure) and a set of four buttons whose functions can be independently define the appropriate Lenovo applications. Of the factory used substitute keyboard shortcuts Ctrl-Alt-Delete, hand rotate the image (the device is not capable of independently detect its own orientation with respect to this parameter to adjust the image on the screen - this procedure is done by hand), Lenovo the start menu and locks all of the above-mentioned key. In the same place and found a fingerprint reader. Finally, we reach the keypad. 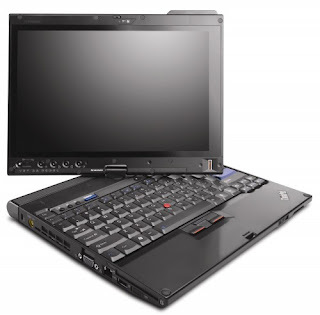 Although the X200t small and foremost a compact, Lenovo engineers are nothing let case - keyboard is drawn the entire body of the device, and therefore offers an ideal deployed and sized keys. What's feelings in respect of the work, ThinkPad users will find the well-known field and enjoy the optimal affected firmness key. Because such deployment touchpad had to be retired, but they should not despair - his role was taken over trackpoint with three keys. Tested configuration variant of this tablet is equipped with Intel processors Core 2 Duo L9400 clock 1.83 GHz, working gigabytes of memory, integrated Intel graphics subsystems GMA X4500MHD and 160-disc gigabyte whose tables turn on the 5.400 rpm. Users who like the performance of numerous configurations will not be high enough, there are more expensive variants with powerful processors, greater amount of working memory (up to four gigabytes of memory DDR3) and faster drives (200- gigabyte disk speed 7.200 rpm or 64- gigabyte SSD). Nokia has officially present your competitor iPhonea. The Nokia 5800 has a 3.2-inch 640 * 360 display a touch, uses the Symbian S60, has a built MP3 player, 3.2 MP camera, built-8GB microSD card, and memory can extend up to 16GB, and there are still Wi-Fi and 3G capabilities, and Bluetooth 2.0. Said that the opportunities that bring the screen a touch use where they really useful, it is for contacts, multimedia and the like. Users would also should receive a free one for music subscription service (Comes with Music) course that will be able to take as much as they want music without restrictions that keep the music and used in other devices. Nokia in 5800 would be very found in the sale price is around 400 $. One of the most famous and largest social service on the Internet has plans for expansion, which includes a possible sale of music over the Internet. Although he announced that Windows 7 will come out 2010.g, although it is not the end of 2009.g not impossible scenario, Microsoft does not give up easily, nor of Windows Vista, even though according to research company Gartner even 61% of the user intends to skip Vista and wait for Windows announced 7th Microsoft would like to attract at least part of such users with announcement of yet another servicing package, which should come out 2009.g. Even the rumors emerged that the limited number of close partners already received SP2 on the test, but still no official confirmation. Microsoft has announced that really works on SP2 for Windows Server 2008, but the dates of departure of any of these are not precise. In an attempt to free space in the pants, Nissan, Sharp and Japanese phone company NTT DoCoMo are arrived at the idea that Smart touch keys, or smart keys for phones. Nissan since 2002. this year, offers customers the chance while Sharp should soon design a mobile phone that would run on NTT DoCoMo network. It is enough to have one phone / key in the pants that would transmit a unique signal. When the owner of the devices went in his car, sensors would recognize the tone and unlock the door when you get lunch. The same signal would be sufficient to prepare an engine, and that is enough to press the Start button. The three companies should introduce a new hybrid by the end of the month of October, of course, only to the Japanese area. iPhone is its success has given inspiration to many, so it is RIM, Blackberry manufacturer of mobile phones, decided to create a version of the device that controls the touch. Blackberrz Storm so, as the iPhone or the new Nokia 5800, has a screen of a touch, but brings something completely new. Specifically, the screen actually clicks when it hit, that is able to deepen the place where you hit it, to mimic real enter key. The device supports 3G network, has a HTML browser, qualified for the audio and video content, and MMS and IM messages, containing 3.2 MP camera, GPS receiver, and more. Storm still does not have a specific price, the sale would be in the USA should be found for the season of winter holidays. Dell has announced that plans to fully come to the use of LED technology in laptop screens in the next twelve months, with the aim to provide durable and reliable hardware. In addition to these display screens to be easily recycled and does live, use less power compared to its precursor. They assess, by the end of next year will be 80% of laptops have LED screens. Senior president Della, Jeff Clarke, said that their customers are looking for what is possible "green" technology, so that the company is trying to satisfying them, but that does not go at the expense of performance. Probably the most popular software for recording CD/DVD, Nero, received its new version in the form of Nero 9 Media Suite package. News is Liquid / Tivoli PC software, which allows for all possibilities popular TiVo system and get on the PC. TiVo PC comes with a remote control, TV card and appropriate Software at a cost of (199USD), and in relation to the ordinary system allows TiVo, and that all the recorded content transmitted to devices such as, iPhone, PSP and the laptop and that can record on optical media. Toshiba announced that they began to produce Solid State disks (SSD) from 256GB for a laptop, and that will be available on the market in the last quarter of this year. These drives were done in 2.50-inch format, and use SATA interfaces. Regarding the performance, speed reading is 120 MB / s, writing a 70 MB / s, which is less than the Intel 250 MB / s SSD drives. Price has not yet been published. Mono 2.0 is OpenSource framework that allows applications to be developed in the framework Microsoft.Net 2.0 launch and on platforms that are not based on Windows. Version 2.0 brings support for C # and LINQ, but unfortunately there is no API for Windows Communication Foundation, Windows Workflow Foundation and Windows Presentation Foundation for. Net 3.0 and 3.5, and they will probably be included in later versions. Mono 2.0 should expand even more market for web applications, which in more cases should not be dependent of the operating system.